It’s been a hectic 4 weeks! I was back east recording four more songs for the new album, running the Park Slope Jamboree, and then attending the IBMA World of Bluegrass Conference. I feel like I’ve been through the wringer, wrung out and then hung out to dry! There’s just too much to tell in one little bitty blog so I’ll save the full story for the newsletter which should be coming out in early November. It felt great to be back in the recording studio with long time bandmates Mark Farrell, Doug Nicolaisen, and Nick Sullivan with special guest Kenny Kosek who is an amazing fiddler. Now the album is almost 2/3 done and we’ll be wrapping up the remaining songs over the winter in sunny AZ. The Jamboree was another rousing success. We had a terrific bunch of bands for the Saturday concert. 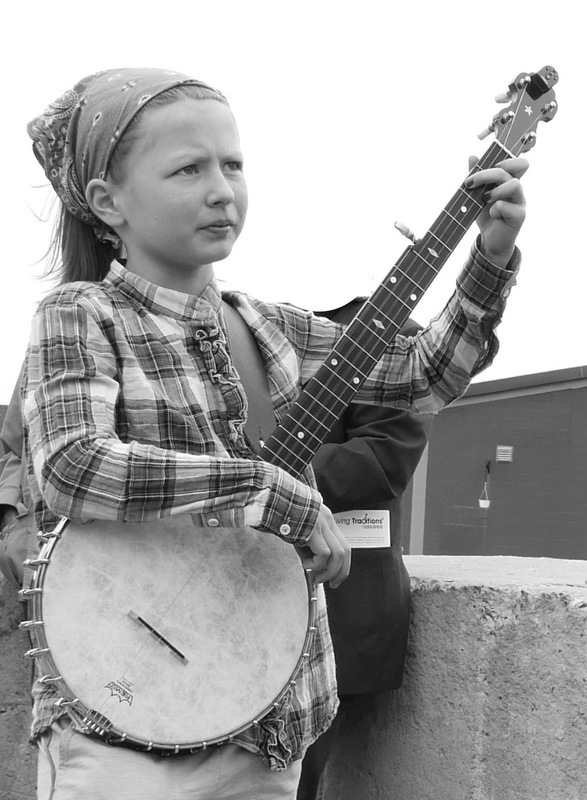 I even ran into a couple of bands from the Jamboree at the World of Bluegrass showcases. It was such an honor to award the Brown Jug to Drew Smith this year. He may have a bookcase full of trophies, but I know he’ll treasure the Brown Jug for years to come! And speaking of Brown Jug winners. I ran into Bill Keith at World of Bluegrass and got a chance to congratulate him on being inducted into the Hall of Fame. The IBMA Conference was a whirlwind of activity and not just because Hurricane Joaquin chose that weekend to make landfall! I have no idea how the organizers and the City of Raleigh managed to move all the outdoor events into protected areas, but they did! I was on pins and needles during the Special Awards Presentation as I waited to hear the winner of the Bluegrass Event of the Year. It was heartwarming to have photos of our little Jamboree up on the big screen for everyone to see. We didn’t win, but we were up against some real giants with RockyGrass and the Lester Flatt Celebration tying for the trophy. Thank you all for your support and best wishes, this nomination meant so much to me. I just love our happy little festival in Brooklyn! Woohoo!!! 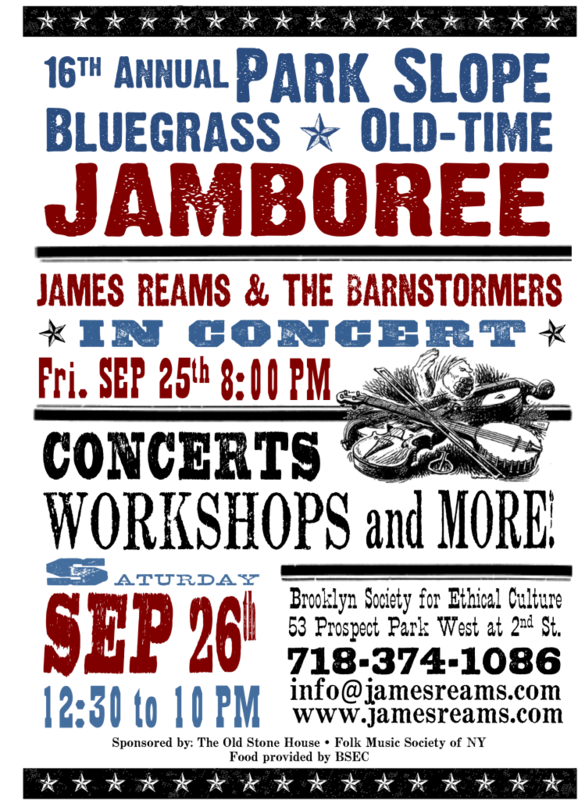 Jamboree Receives IBMA Nomination as 2014 Event of the Year! I can’t begin to tell you how thrilled I am that our “happy little festival” in Brooklyn has been nominated for the IBMA 2014 Event of the Year! And “YES!” it is an honor just to be nominated. Wow! This is just so exciting! 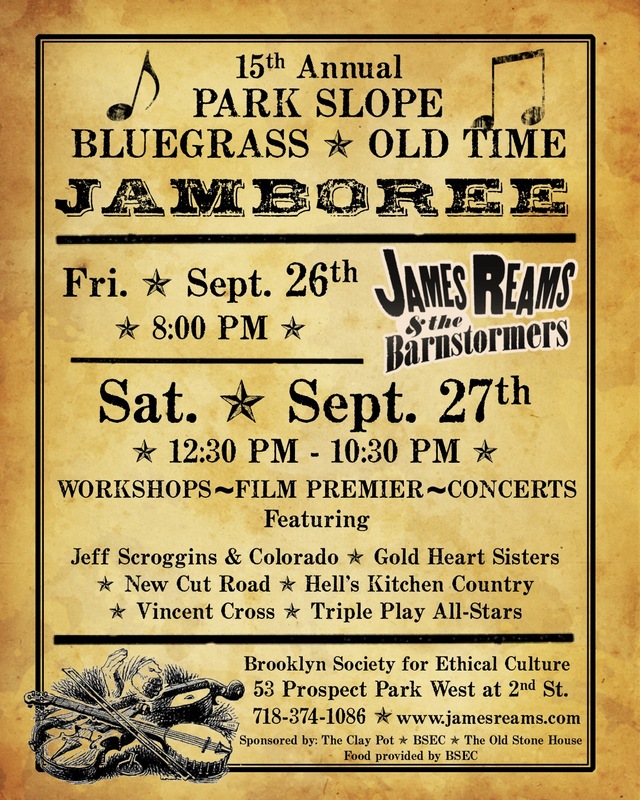 The Park Slope Bluegrass and Old-Time Music Jamboree has been a labor of love for me for 16 years now. I almost chucked in the towel on the Jamboree after my partner, Tina, passed away but something deep inside me just wouldn’t let me give it up. And I’m so glad I didn’t! Last year’s festival honored Bill Keith with the Brown Jug Award for his contributions to bluegrass music and I’m proud to see that he has been selected as a 2015 Inductee into the Bluegrass Hall of Fame. I hope the news of this nomination encourages more folks to come out and join us on September 25-26 for our 16th Jamboree. We’ve got a great lineup of artists and workshops planned! More information is available on this website under the “Jamboree” tab. Sure had a great time back east and catching up with folks. Our concert at the Jalopy Theatre was fun as always. I just love the intimacy that venue provides. And then the band and I headed off to Pennsylvania for the Wind Gap Bluegrass Festival. You couldn’t have picked a nicer weekend or prettier spot for a festival. It’s always a rip-roaring good time at Wind Gap and this year we raised the bar even higher. If you missed us in June, I’ll be back east again in July for a special performance at the First Unitarian Church in Brooklyn as part of the Good Coffeehouse Concert Series. Tickets are on sale through Brown Paper Tickets.com. See you soon! Woohoo! The Jamboree is Almost Here! 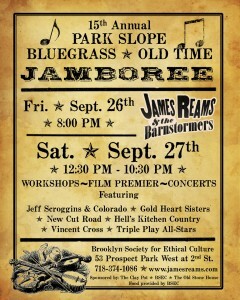 I am just so excited about the upcoming 15th Annual Park Slope Bluegrass and Old-Time Music Jamboree. The Brooklyn Society for Ethical Culture will be hopping with all that we have going on. Starting with the kickoff concert on Friday night, featuring yours truly, the weekend will be jam packed with all things bluegrass. 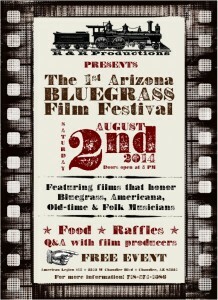 This year we’ll also include the NY premier of the documentary “Herschel Sizemore: Mandolin in B” with a Q&A by the director/producer Rick Bowman. Lots of exciting workshops are planned plus a new one that I’m leading this year “Jam Camp for Kids.” I hope this one becomes a permanent addition! And our concert performances on Saturday night feature bands from NYC as well as Colorado and Virginia. Don’t forget the Brown Jug Award…this year’s winner is a hot item on the awards circuit. So come on out to the best little festival in NYC! You’re in for a real treat! For more information click on the Jamboree menu on my website. Just got back from the Santa Fe Bluegrass and Old Time Music Festival put on by the Southwest Pickers organization. What a great show! Everything went smoothly and was so well organized that it felt like a dream. And the warm welcome we received made us feel right at home. 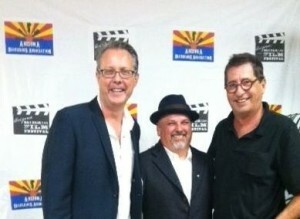 After not one, but TWO standing ovations, we finally dragged ourselves off the stage and headed for home. Our heads were in the clouds and our hearts were full from all the wonderful comments – this show was honestly a performer’s dream job. It’s an annual event so I recommend that anyone within driving distance head out next year to beautiful Santa Fe…this is one festival you won’t want to miss! Cool Times in the Big Apple!